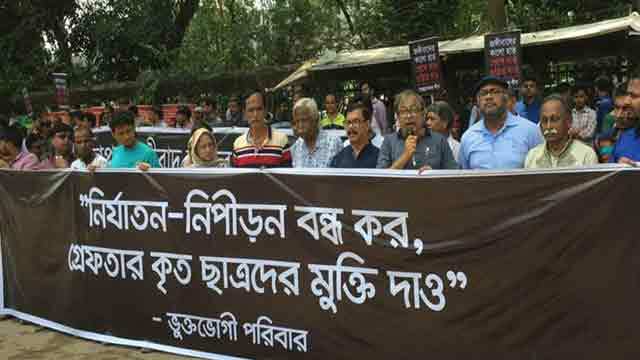 Dhaka, Aug 17 (Just News): Citizens today formed a human chain in front of Jatiya Press Club in Dhaka demanding the release of noted photographer Shahidul Alam and students who have been detained in connection to student movements for quota reform and safe roads. Family members of the detained students and human rights activists formed the human chain at 10:30am under the banner of “Afflicted Families” to press home their demands. They also demanded justice for the journalists who were attacked during the movement for safe roads. “These arrests are creating an environment of fear, from which our nation need to be freed,” said noted human rights activist Nur Khan. “The way students are dragged into law enforcers’ custody cannot be the sign of a civilised society,” said Dr Zafrullah Chowdhury, founder of the Gonoshasthaya Kendra. “As this government has not come to the power through public mandate, they fear any kind of movement,” said Mahmudur Rahman Manna, convener of Nagorik Oikya. Shafiqul Islam, father of Torikul Islam, a detained quota reform activist and student of Dhaka University (DU), requested the authorities to release his son so that he could join his family in the upcoming Eid-ul-Azha.